I'm getting married in less than a month... !!! I recently came across an article I tore out of a magazine that had beauty tips leading up to the big day. It recommended a 3-day juice cleanse for your skin the month before the wedding. I found a deal on RueLaLa and am going to give it a try... wish me luck. I know I will be "hangry". I will be in need of a detox after my bachelorette party in Atlantic City this weekend. My friend put together these awesome pink and green goody bags for the ladies on the trip and mailed them out in advance. I was so excited to see my face on the shirts and coozies. Here is my friend Dineen's that she Instagrammed. Jersey Shore here we come! Those bags are so cute! Best of luck with the cleanse! Oh my GOODNESS ... what a killer bachelorette bag! That is absolutely, positively awesome! o god good luck! I could not do a juice cleanse! Call me crazy and maybe you wrote about this and I missed it but were you on abc family's "the vineyard" as a bride!?!? I paused it and was like nooo way her names Lindsay and it looks like her and it's at the vineyard.. My boyfriend totally thinks I have issues! hi! i just saw you abc's The vineyard, and i just thought i would let you know that it looked like such a perfect low key wedding, and you and your husband look very happy together. best wishes! 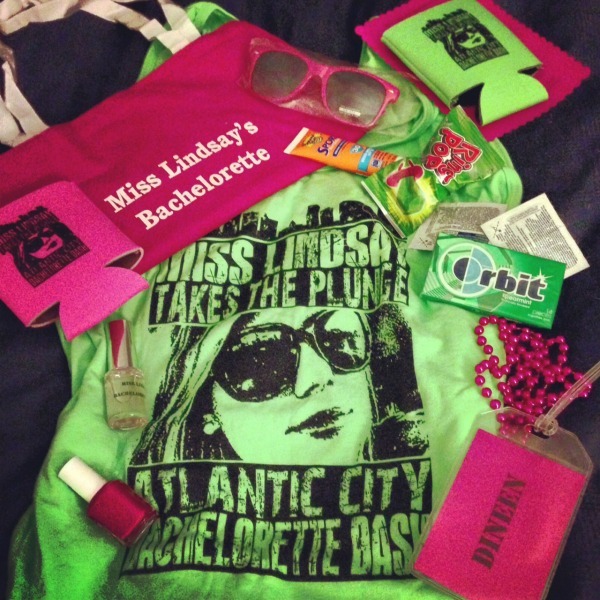 That's is an awesome bachelorette bag! I was looking for ideas on this the other day and this is definitely the best!